Having a good scanner can save you a lot of pains when that check engine signal pops up in your car. A good scanner does not have to be expensive or big; it just needs to get the job done. 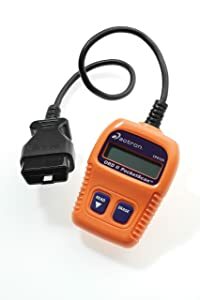 This review takes a detailed look at the Actron CP9125 OBD II code reader. It bases on personal and other users’ experiences to lay bare the good and the bad of the pocket scanner. Read on for an insight to help you decide whether this is the right scanner for you. This scanner is ideal for backyard mechanics who are quite familiar with common errors. The CP9125 (full name Actron CP9125 C Pocket Scan Code Reader) is a hand-held scanner from Actron’s line of automobile accessories. It is used to scan and display error codes on CAN and OBD II protocol vehicles (US manufacture 1996 or later, EU 2000+ and Asia 2004+). It is compatible with a variety of cars and light trucks. An error database of over 5000 codes makes it suitable for a variety of car models- Nissan, Chevy, Toyota, BMW, Subaru e.t.c. Unlike many scanners that are specific to 12v cars, the CP9125 is versatile. It attaches to the vehicle via a 16-pin plug attaching to the OBD II port on the dashboard. The vehicle’s battery will power the scanner and thus it does not require a separate battery. The CP9125 does not give error meanings. You will need a separate manual or online resource to define error meanings displayed on the CP9125. The scanner allows software updates to keep it in the loop of emerging scanning needs. Actron offers a one-year limited warranty from the date of purchase for this product. Actron CP9125 can read and clear DTCs, display CEL status, and I/M status. A CP9125 delivery box contains the scanner and a separate code manual. The scanner is a display head with two buttons and a screen. It has a rubber cord with a 16-pin plug-in head. The ‘Read’ button is used to pull, display and scroll errors and the ‘Erase’ is used to clear them. The screen displays the Diagnostic Trouble Codes (DTC’s) and also gives the Malfunction Indicator Lamp (MIL) Status. Once you plug the scanner into the OBD II port on the car, it prompts you to turn on the car’s ignition. Once this is done, it will automatically pull the errors from the computer and display their codes. The connector cable contains both power and data pins. This scanner will search for both electrical and fuel/air system errors. It, however, does not pull ABS errors. Usually, a single problem may cause several errors to appear on the screen. For instance, an emission problem may cause an O2 sensor error to appear together with the emission one. Fixing the emission problem will make both errors disappear. Scrolling down the ‘read’ button takes you to the next error that has been scanned. You can scroll back up in case you need to get back to a previously read error. A ‘No Link’ response signifies that you have not turned the ignition all the way on. Can the scanner work if a vehicle engine cannot start? Yes, it can. All you need is to turn on the ignition, not start the engine. The battery would, however, need to have some charge needed to power the scanner. Ensure to coil the cord when not in use. This will prevent it from breaking at the end where it attaches to the screen and the plug. Remember to cover the plug-in end to prevent bending or breaking of the OBD II pins. Storing in the original delivery box is the safest practice. Can perform O2, I/M readiness Tests. Bottom Line ANCEL AD310 focuses on beginners who want to turn off the CEL. Actron CP9125C is ideal for backyard mechanics who are quite familiar with common errors. 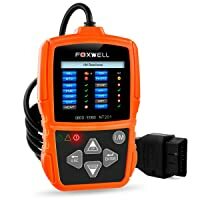 Foxwell NT201 is great code reader for beginners and DIYers. The Actron Scanner CP9125 appears to struggle when measured against other scanners in its class. A big advantage, however, is its ability to scan a huge variety of vehicles. 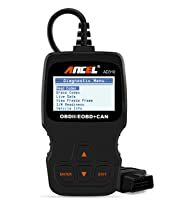 This scanner is ideal for backyard mechanics who are quite familiar with common errors. People dealing with cars of varying battery sizes will also love its versatility.